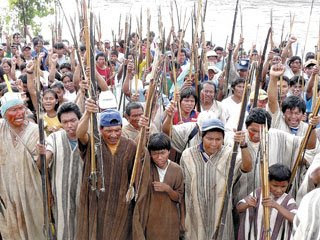 The Narcosphere's Kristen Bricker reports that U.S. aid to Peru to fight the Drug War can be directly linked to the violence in the Amazon that has resulted in the deaths of police and indigenous people, as well as the disappearance of at least 60 more indigenous people. As we reported earlier this month, indigenous groups mobilized throughout the north of Peru in protest of legislation that opened the region to oil and timber exploration without the approval of those living there (who are majority indigenous). The protests turned violent, with numerous activist videos showing what turned into a war zone. After weeks of protests, violence and stand-offs, the president, Alan Garcia, rescinded the legislation - a seeming victory for the indigenous. Billions of dollars of U.S. taxpayer money has been spent on the Drug War, and many would argue that this is with good reason. However, with the skyrocketing number of people in U.S. prisons for non-violent drug charges, continuing and even escalating drug-related violence throughout the Americas, and the extreme militarization of a number of Latin American countries, Drug War money continues to be put to other uses. Should the U.S. government be held responsible for these events? Maybe the U.S. taxpayer? Labels: DrugWar, indigenous issues, latin america, U.S. Thanks for this post. This is yet another reason why we need to rethink the Drug War NOW!